What exactly is a Tactical Sports Patch? Well, thats easy, its the sports patches that you love, but made for military and police gear. The patches are made the right size - mainly to fit into a 2 x 3 standard flag size, or a standard 3-3.5 round size, so that they will fit onto the 4inch real estate on uniforms, and also to fit onto the velcro real estate on just about any gear. How do we do this? For us, its quite easy - we are Master Patchologists AND Master Digitizers (Supreme level) so we can do just about anything in embroidery. Here are a few of the designs that we came up with to start. We will be adding many new designs in the days to come! Awesome! 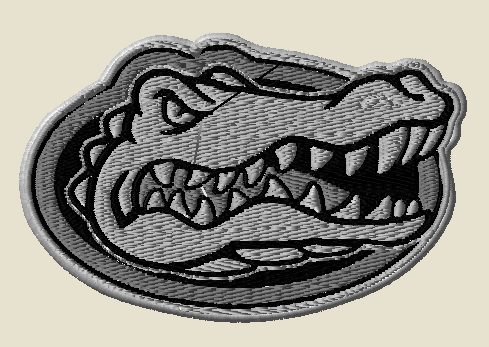 you can get the Florida Gators patch in full color, tans subdued, OD subdued and SWAT/ACU colors. The patch is 100% embroidery so no camo background is required to order, but the patches will match your gear. Order FULL COLOUR for the full coloUr versions of the patch - the coloUrs on the selection bar don't necessarily correspond to the actually full colours of the patch - ie. some patches may include bright yellow, orange and purple.